Updated! Republican Michael Gage To Make Calls At McDonnell HQ In Richmond | Virginia Right! UPDATE: I have it on good authority that Michael is bringing some of his world famous Cheesecake for the callers tomorrow night. I have been hearing about his Cheesecakes for months. Arrive early! 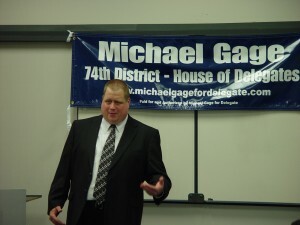 Republican Michael Gage is running for the Virginia House 73rd District seat. Michael and Karen Gage will be making calls from the Virginia Victory Center on Wednesday, September 15, 2009 at 2819 N. Parham Rd, Suite 210 – Richmond, VA 23294. Please come by and support our Republican ticket and meet Michael Gage. I promise you will be impressed. The hours are from 5:00 PM to 9:00 PM. Please check out posts on Michael’s Get Together and his Town Hall.